So tomorrow is the end of the world. At least it is if you believe the Mayan calendar and a bunch of crazy doomsday preppers. You see, if you consult our favorite scholarly reference Wikipedia, you'll find that 21 December 2012 is the end of a 5125-year-long cycle in the Mesoamerican Long Count calendar, a date in which a variety of eschatological beliefs feel will bring cataclysmic or transformative events. The events of course will lead to the end of the world as we know it. No, not the song by R.E.M. What does this have to do with WestToast? Absolutely nothing, except that if the world is going to end, shouldn't we all be drunk when that takes place? "But Josh", I hear you saying right now, "when the apocalypse hits will our booze be safe to drink?" Well it turns out the Federal Civil Defense Commission had the very same question in 1955, and you might be surprised by the results as summarized by an actual legitimate journalist, Robert Krulwich of NPR. 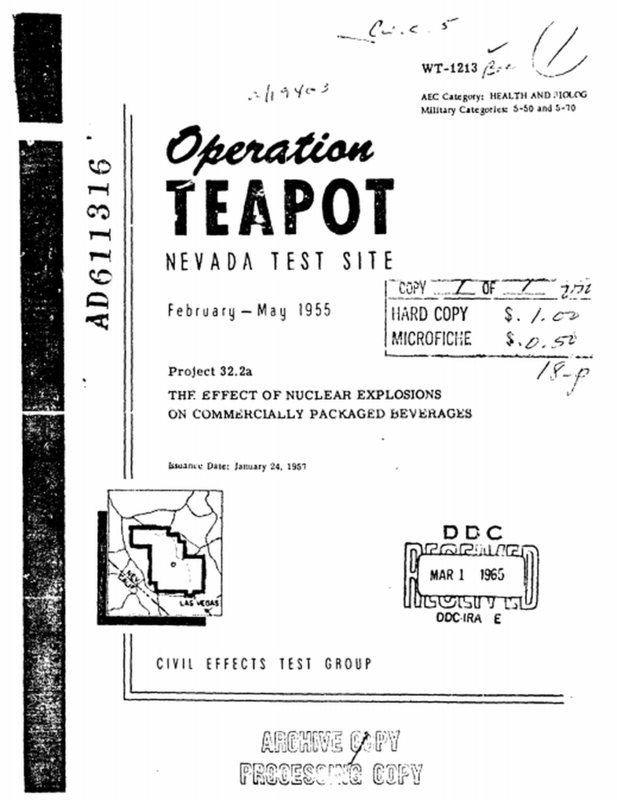 Operation Teapot it was called, researching "The Effect of Nuclear Explosions on Commercially Packaged Beverages." Yes, the US Government actually placed canned and bottled beer in proximity to a nuclear explosion at the Nevada Test Site and then tasted the beer. 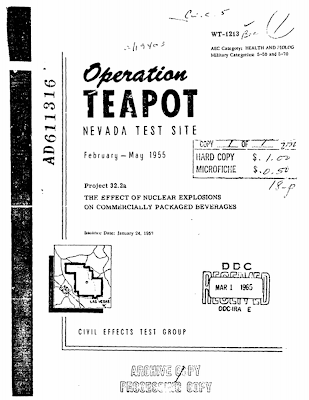 You can only imagine how bored these scientists must have been in the middle of the Nevada desert in 1955; World War 2 was over and sure, it was the heat of the Cold War, but the Russians didn't drink beer at that time so it could be our secret weapon. A bit lonely, these Manhattan Project scientists concocted the ultimate frat party scenario -- "Dude, come out to the desert and drink beer with us. We have Atomic Bombs!" I can only imagine the street cred one gains from hosting that party. Now, to answer the question you're all wondering, yes...the beer was safe. For the bottles and cans that didn't break in the actual explosion, this study found that the level of radioactivity in the beer placed 1/4 miles from the nuclear explosion was "within permissible limits for emergency use." Further, taste tests indicated that, while a bit "off" in flavor, the beer was "still of commercial quality..."
Friday you can crack open your favorite brew, fight off the Zombies, and feel comfort in knowing that you can safely drink to your hearts content after the nuclear dawn. Eat, Sip, and Be Merry Ticket Contest!! !